By Jon Greenberg on Friday, January 18th, 2019 at 12:00 p.m.
Democratic presidential candidate John Delaney, a former Maryland congressman, poured cold water on fans of small government who support the current partial shutdown. "Interesting that some of Trump's advisers think shutdown shrinks government," Delaney tweeted Jan. 15 in response to a news report. "It costs between $12-20 Million more an HOUR to run gov't during shutdown - it's MORE expensive to run a closed government." In past shutdowns, we found that it does cost more to close the government than keep it open. When this partial shutdown ends, Washington has agreed to pay government employees every penny they were due, even if they didn’t work during the impasse. For those who didn’t work, the government will have paid for the value of the work not done. Every shutdown is different and calculating the cost of any shutdown is a dicey business.​ The estimates for the partial shutdown so far are imprecise — so we are not rating this on the Truth-O-Meter. With no resolution in sight, however, it's safe to say the impact will only grow. Delaney’s office said his number starts with an analysis from the 2013 shutdown that lasted 16 days. The consulting firm IHT Global Insight estimated that it cost the government $12.5 million an hour to furlough 800,000 workers. That was the price tag to pay people for work not done. Delaney also looked at the impact on federal revenues. Independent analysts said the shutdown reduced growth by about $23 billion. Money not earned is money not taxed, according to Delaney’s team, and those lost revenues came out to an hourly cost of nearly $20 million an hour. Recent articles in Fortune, the New York Times and Politico support the idea that it’s cheaper to keep the government running. They note that the Office of Management and Budget estimated that the cost of the 16-day 2013 shutdown included $2 billion in compensation paid for work not done. Plus, unpaid workers cut back on shopping, which sends ripple effects through the wider economy. Many government contractors make less and that also puts a drag on GDP. But none of those articles landed on a final price tag, much less an hourly rate. Of all the impacts of a shutdown, the matter of paying furloughed workers is the clearest hit on the government’s wallet. In economic terms, people who work without pay are very different from those who are furloughed. Those who work without pay provide a service. Setting aside their personal pain, when they finally get their paychecks, the scales roughly balance out. But the furloughed employees, who don't work at all during the shutdown, are given back pay after the government reopens, even though they didn't render any services during the closure. Based on department and agency shutdown plans and a New York Times analysis of the total payroll due, we calculated that across 10 agencies, Washington owes 240,000 workers about $1.2 billion, as of Delaney’s tweet, made on Day 25 of the shutdown. Two caveats: Nearly 30 agencies and departments remain unfunded, but we dug into only the largest ones, meaning our figure is an undercount. We left about 20,000 workers out of the equation. Also, our estimate is a snapshot. The number grows as the shutdown lingers. As of the day Delaney posted his tweet, there were 15 work days without pay. (We don’t count weekends and holidays). Remember, our goal is to put an hourly value on the work not done. Assuming staff work a typical eight-hour day, that $1.2 billion breaks down to a value of lost labor of $10 million per hour. Another major cost to the government comes through lower tax revenues. 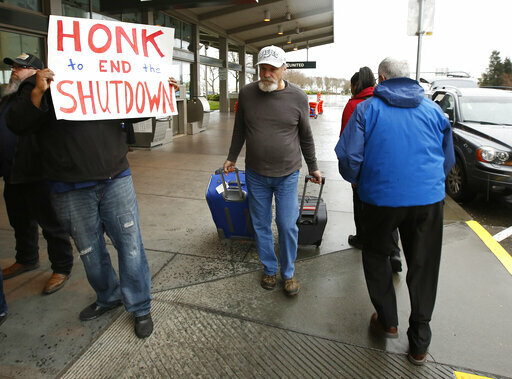 Shutdowns hurt the economy, and as it declines, so do tax collections. Kevin Hassett, chair of the White House Council of Economic Advisors, said that the shutdown "should not have a long-run effect on GDP growth." But he has offered two estimates of what the short term costs could be. Initially, on Jan. 3, he said a rule of thumb is every two weeks cuts 0.1 percent from real GDP. The most recent government figures put the economy at $20.65 trillion, or about $2.4 billion an hour. Twenty-four full shutdown days had passed on the day Delaney posted his tweet. Hassett’s rule of thumb yields a hit on the economy of $4 million an hour. Hassett later upped his estimate, saying that the decline could be .26 percent every two weeks. That would raise the short term economic cost to about $10 million an hour. Since federal taxes are 17 percent of GDP, that $10 million an hour translates into about $1.7 million less in taxes for each hour of the shutdown. There might be other costs, such as fees not collected at national parks or potentially late payment fees on bills from contractors that go unpaid. The extent of those won't be known until well after the shutdown ends. Hassett argued that growth would make up for the short-term losses. Gary Burtless, an economist at the Brookings Institution, says the opposite might be true. "A malfunctioning, unreliable government undermines confidence, pushes citizens and businesses to take costly measures to protect themselves against added uncertainty and risk, and deprives the public sector from obtaining the services of some talented workers who look elsewhere for employment," Burtless said. If that’s the case, then the costs go up again. Our simplest takeaway: Whether it's an extra $8 million an hour or $15 million an hour, it costs a lot to shutter even just part of the government.